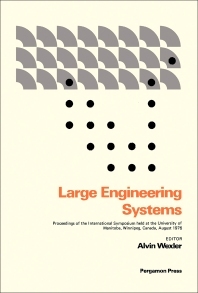 Large Engineering Systems documents the proceedings of the International Symposium held at the University of Manitoba, Canada on August 9-12, 1976. This book compiles papers on the technology of large engineering systems. The topics discussed include the analysis of an automobile body by finite element method; finite-element solution of boundary integral equations; optimum design of stiffened plate girders; and tuning of miniaturized analog hybrid circuits. The sparsity in large systems and trans-shipment problems; finite difference method with graded lattices; Kron's multidimensional electromagnetic networks; and analyses of large systems are also deliberated. This text likewise covers the transient phenomena in large electrical power systems; modeling for regional electric power supply system; and efficient method for reliability evaluation of large-scale systems. This publication is a good source for engineers who intend to acquire knowledge on large-scale engineering systems.